There are three different PCB designs in the 850 EVO lineup. The 120GB and 250GB models (above) use a tiny PCB with room for two NAND packages (one on each side). Interestingly enough, both use octal-die packages, meaning that the 120GB 850 EVO only has a single 128GB (8*16GB) NAND package. Decoding the part number reveals that the packages are equipped with eight chip enablers (CEs), so a single NAND package is viable since all eight dies can be accessed simultaneously. The use of octal-die packages is actually true for all capacities. 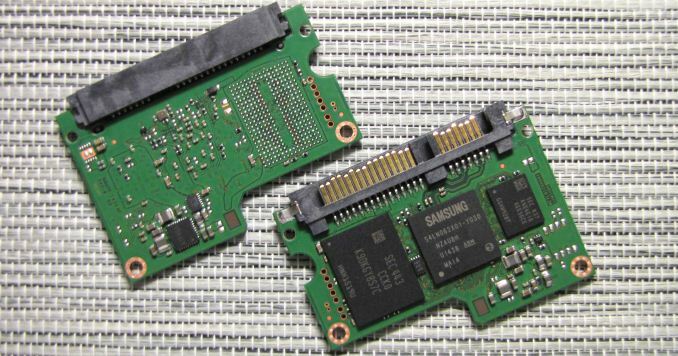 It's an interesting choice nevertheless, but I suspect Samsung's packaging technology is advanced and mature enough that it's more cost efficient to use high die count packages and small PCBs instead of larger PCBs with more and less dense NAND packages. 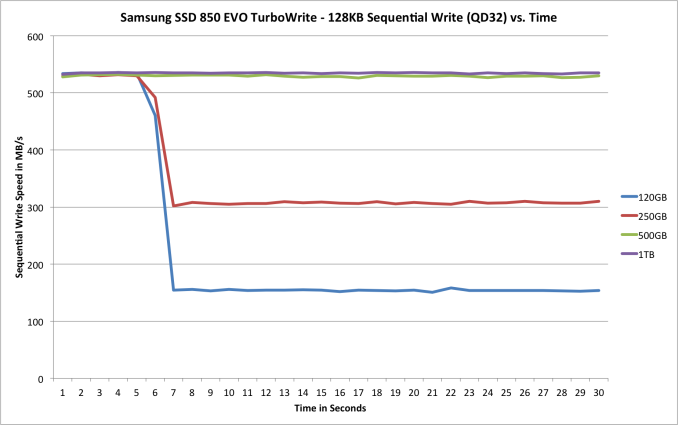 TurboWrite is a feature that Samsung brought to the 840 EVO to increase write performance. The idea of running a small portion of the NAND in SLC mode was nothing new, but it was the first time it truly made sense because the 840 EVO used slower TLC NAND and hence the SLC buffer could provide significant improvements to write performance and user experience. Unsurprisingly, TurboWrite is also present in the 850 EVO. The buffer sizes and core architecture have remained unchanged. All writes hit the SLC buffer first, from which they then get moved to the TLC array during idle time. The only exception is a case of long, sustained period of writes that exceeds the buffer size, in which case the data will be written straight to the TLC portion. Samsung's reviewer's guide states that the 850 EVO features "enhanced TurboWrite technology" with a focus on random write performance, but I don't have any additional details as to how the TurboWrite implementation in the 850 EVO differs from the 840 EVO. TurboWrite was always designed to cache all writes regardless of the nature of the write (random vs sequential), so I'm not sure if anything has actually changed. Obviously the algorithms have been optimized for the new NAND and controller architecture and it's possible that the whole batch of algorithms has improved in the process, but I'll provide an update when I hear back from Samsung. 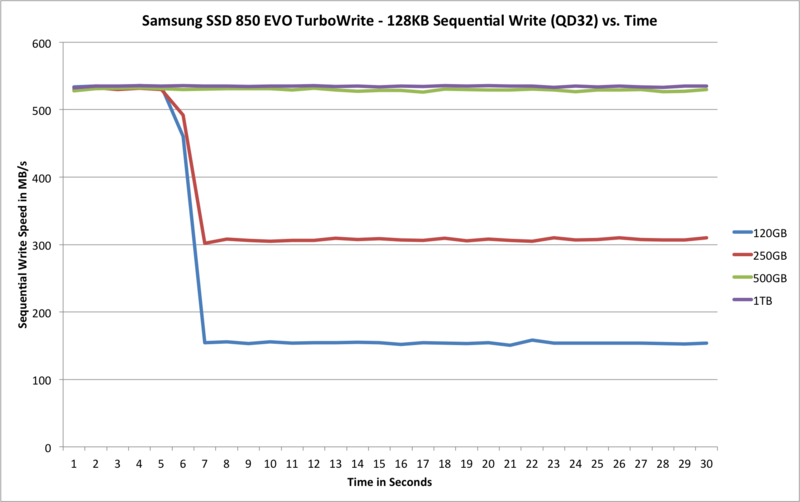 I ran a quick sequential write test to see how TurboWrite behaves in the 850 EVO. 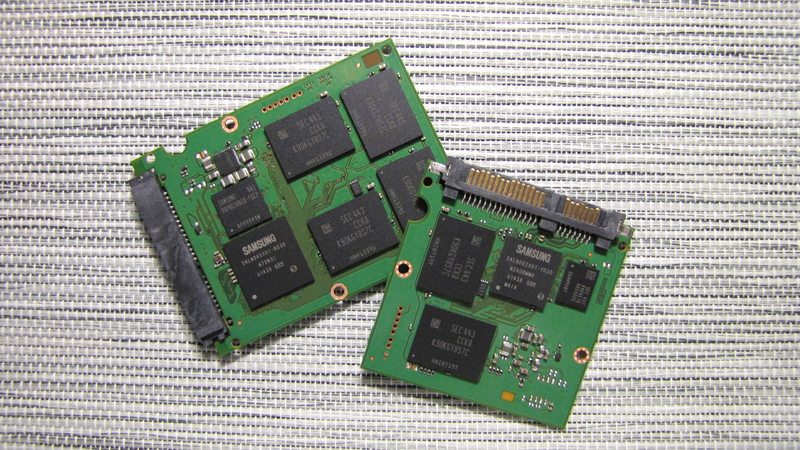 At smaller capacities it clearly provides a tremendous performance boost, but at 500GB and 1TB there is enough NAND to provide the parallelism that is needed to max out the SATA 6Gbps interface. That is a big improvement over the 840 EVO as its write performance maxed out at ~400MB/s when writing to the TLC array, so the performance benefits of 3D NAND technology are already evident. The over-provisioning figures in the article are larger than the actual over-provisioning values. The source of error is failure to account for the flash memory used for TurboWrite. Samsung SSD 850 Evo is a life-changer for anyone who uses it. With the sleek and beautiful build quality, Evo 850 does obviously come with a great price tag. There are of course different capacities of the given product, but I preferred to use the 120 GB version, largely due to the relatively low price and my actual need of owning an SSD. My major requirement was to install the Operating System and few other mostly used applications inside the SSD, so that the whole computer looks so fast. Samsung Evo 850 120 GB SSD has done the job fantastically for me so far and I highly recommend this product to everyone. Out of the sellers online, GearBest seems to offer the best package since GB is a trusted source of products. They are offering a flash sale at the moment and you may try it to get it for a relatively a low price. Samsung OWNS the SSD market! When I can buy an 850 EVO 500 GB model for just $110 and get for all intents and purposes, the BEST possible speed from a SATA 6 drive - there is REALLY NO POINT in buying ANY other brand! I mean the 850 EVO keeps up with, and sometimes even SURPASSES the 850 PRO - often in ways that will benefit the average power user/gamer more! I wonder how much of that is due to the 6 GB of SLC write cache - as the 850 PRO series has no SLC NAND whatsoever! Also, once the "Magical" storage capacity of 480 GB and above is reached, again, for JUST $110 - not only is that more than sufficient to hold my OS and all the games I play, but all SSDs tend to perform best at 480 GB and above, I would say for the 850 EVO series, this is DOUBLY TRUE! Due to the fact that the 500 GB model has a full 6 GB of SLC Turbo-write NAND (compared to 3 for the 250 and 120) - but it also has a full 512 MB of DDR3L on it! I know this article is quite outdated right now, nevertheless the actual topic of the authors "Final Words" bug me right now. Especially now that enough time for longtime-endurance tests has passed. Anyway, I can´t choose between the Samsung EVO 850 1TB v2 (289€) and die SanDisk Extreme 960GB (281€). So, usually I use hardware until it´s broken so meaning about 8-10 years.